When I made pineapple sorbet I was left with half of a fresh and juicy pineapple. I was tempted to eat it all by myself, but I decided to bake Coconut Pineapple Bread instead. Coconut and pineapple are a match made in heaven. I figured I couldn’t go wrong with adding them both to a sweet and buttery quick bread. I cut up the fresh pineapple into chunks and got out all of my ingredients to bake bread. First, I toasted the coconut. It is amazing what a few minutes in the oven will do to coconut. I love the slight nutty flavor of toasted coconut. It is the best! Next, I added the toasted coconut and fresh pineapple chunks to the bread batter. I gently folded them into the batter until the mixture was combined. I poured the batter in the pan and topped it off with the additional coconut. I didn’t toast this coconut because the oven toasts it while baking. The bread bakes for about an hour. Our house smelled like a tropical paradise! I couldn’t wait to slice into the bread. This bread reminds me of pineapple upside down cake, but in loaf form. The bread is very moist thanks to the sour cream and butter. 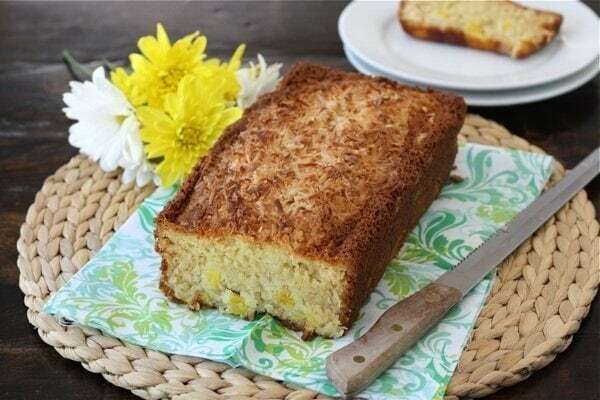 Coconut and pineapple chunks are scattered throughout the loaf. 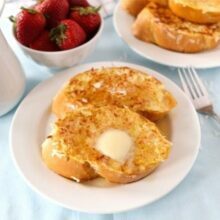 The coconut topping adds a nice crunch to the buttery loaf of bread. This quick bread makes a great snack, breakfast, or is plenty sweet for dessert. We enjoyed a slice with a scoop of cold pineapple sorbet. I felt like I was on a tropical island enjoying a sweet and summery dessert. If you like coconut and pineapple-this is the bread for you. It is easy to make and each slice will transport you to tropical paradise. 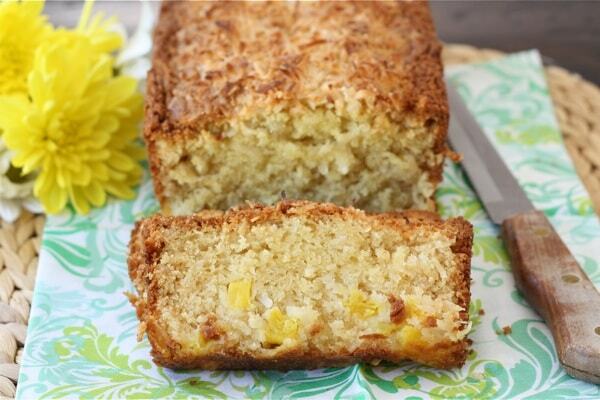 This easy Coconut Pineapple quick bread will make you feel like you are on a tropical island. 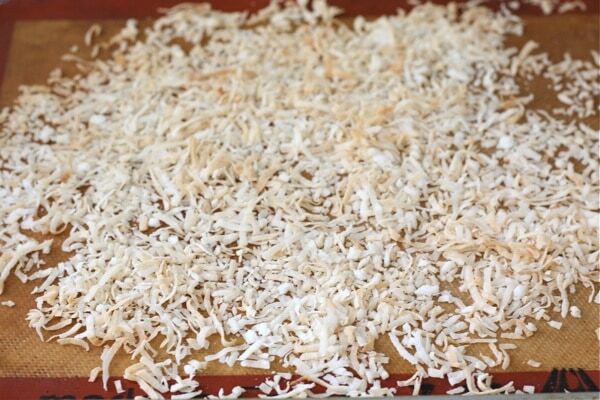 Preheat oven to 350 degrees F. Spread 1 cup of the coconut on a baking sheet. Bake until lightly toasted, tossing occasionally, 6 to 10 minutes; set aside. Grease a 9-by-5-inch loaf pan and set aside. In the bowl of a stand mixer, beat butter and sugar until light and fluffy. Add eggs, one at a time, beating well after each addition. Reduce speed to low, and alternately add flour mixture in three parts and sour cream in two, beginning and ending with flour mixture. Mix just until combined. 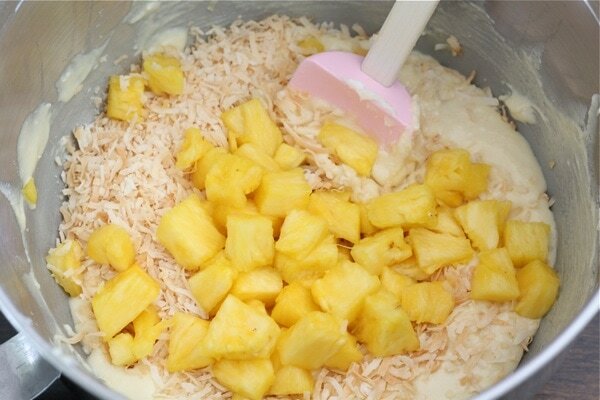 Using a rubber spatula, fold pineapple and toasted coconut into batter. Pour batter into prepared pan, and smooth top; sprinkle with remaining 1/2 cup coconut. Bake until a toothpick inserted in center comes out clean, 60 to 65 minutes (cover pan with foil halfway through so the top of the bread doesn't burn). Remove bread from oven and let cool in pan for 15 minutes. Remove from pan, and transfer to a wire rack to cool completely. Slice and serve. So soft and moist looking! A beautiful cake. Those exotic flavors are just heavenly. I AM SOLD!! It looks and sounds phenomenal, Maria. Wow. It looks sooooo good. I can almost taste it from here! Amazing job and the fact that it’s moist…love it! LOVE the look of this bread Maria! This sounds so yummy! Love this combination. It’s like beach bread! 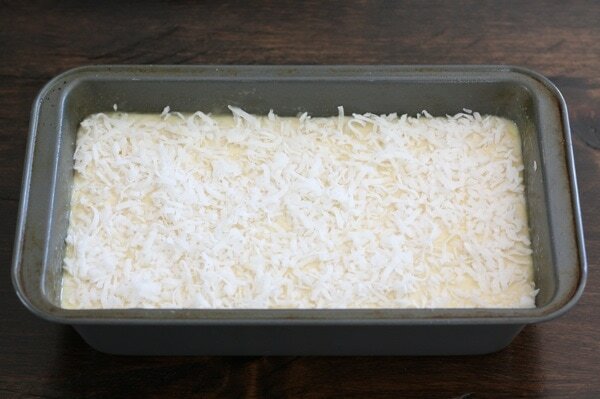 mmmmm…you should call this “tropical vacation in a loaf pan”! We just juiced a pineapple last night and it irks me how much pulp is left over from it so I happened to save it this time. I’m wondering if I could incorporate some of it into this bread? I only used fresh pineapple chunks, not the juice, but you could certainly try adding a bit. Maria, this coconut bread looks so tasty. I agree, the true flavor of coconut presents itself when you toast it. I wanna a bite! I’ve never had pineapple in bread form. Very cool! Now all you need is a beach and Don Ho. Looks delicious – love the flavor combination! Fantastic!!! What a unique and beautiful flavor combination! What a pretty bread! I love the promise of the crunchy coconut topping. Yum, a perfect combination of flavours! This bread looks lovely. I love the combo of flavors! I was wondering how you adapted from the MS recipe. I made that one a while back and it came out ok. I had really high hopes for it! Maybe you’ve changed it for the better! What were the differences? Thanks! I used fresh pineapple, not canned. I also didn’t toast all of the coconut. We enjoyed it! Oh wow! I have never seen a combination like this before for a bread. Seems delicious and perfect for summer! What’s the one thing you can’t live without in your kitchen? I made my list!!! omg yum! I am featuring this on my facebook page today as my “recipe of the day” Hope you had a good weekend! Before I even saw the photos, I knew I wanted to try this just from the title. Sounds delicious! This might be my favorite quickbread of yours yet! A tropical masterpiece. I will be making this bread… SOON! OMG to that toasty coconut topping. YUM!!!! I adore coconut and pineapple, so I can only imagine how much I’d love this bread. Once our oven is fixed, I can’t wait to make it! Do you think I could substitute Greek yogurt for the sour cream? Yes, you can use Greek yogurt. Enjoy! Love, love both pineapple and coconut. Looks rich and delicious!! Pingback: Tune in for Two Cent Tuesday. « All I Eat Food! Pineapple upside down cake used to be one of my mom’s favorite desserts to make. I’m sure she’s going to love this! I was certain i had already commented on this! My mums favourite is the classic upside down also and this just looks so darn delicious i think it would go down a storm here 🙂 Ive already saved it and hope to make it sooner rather than later! This looks and sound heavenly!! This is going on my must make list!! Love toasted coconut! This bread looks fabulous! 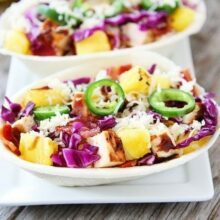 I soooo can’t wait to make this! 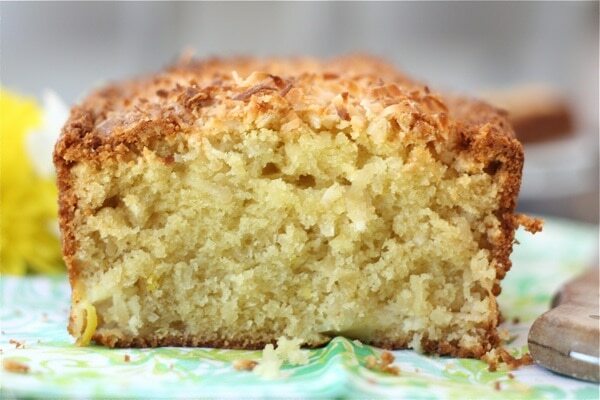 Maria – such a pretty tropical, moist quick bread, reminds me of Hawaii, one of my favorite destinations! Oh my goodness. I literally just arrived home from Maui this afternoon. 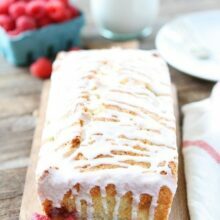 The first thing I told my husband that I wanted to do was find a recipe for pineapple coconut loaf. And then … I stumbled onto your site. I am trying this tomorrow, forget the laundry!! Sounds yummy – adding a few maraschino cherries comes to my mind too….yummy! I’ve made coconut pineapple cakes before, but never bread. Actually, I’ve never baked ANY bread at all. This sounds so amazingly delicious! Tropical paradise, for sure! it IS amazing how toasting coconut changes everything about it. amazing and wonderful. great loaf, maria! 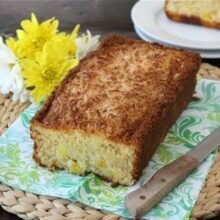 Yum, I love how much coconut you packed in and I’ve never made pineapple bread so I’ll have to try this! I say “tried” because it wouldn’t finish baking. I had various raw spots around the pineapple chunks. Should I have put the fresh pineapple in a cheesecloth to drain? I could practically taste it, it smelt so good!! I didn’t have to drain my pineapple. Did you bake it long enough? Not sure what happened, but the loaf overflowed in the oven while baking. I used the appropriate size loaf pan. replacing it with another because it was smoking so much. It wasn’t done at 60 minutes so it’s still baking. I followed the recipe to the letter. Won’t be making this again as it was a waste of my morning! This looks SO GOOD. I love pineapple in cakes, it makes it extra moist! Soo sad. I tried making this bread yesterday, but it was still raw after 60 minutes of baking. SO I continued baking it on 345 for another 30 minutes because the outside was being burned. However it just sunk back and still so raw and wet. Do you think it is because i lowered the temp? Please help me. I really wanna make this bread. Thanks Maria. I didn’t have any trouble with the bread not baking. It browned nicely for me so I had to cover it with foil. I am not sure why yours didn’t bake. Did you use the right size pan? Sorry you had trouble. As we don’t have baking soda in Australia… only baking powder…how can I adapt this? Hi-I’ve only made the recipe with baking soda. 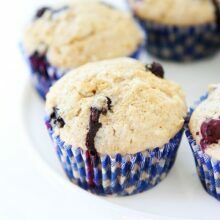 You can try substituting baking powder. Is that what you usually use for baked goods? What on Earth? Of course we have baking soda in Australia. What kind of ridiculous alternate reality are you living in? Baking Soda and Bicarb Soda are the same thing. Moreover, and this has nothing to do with me posting this comment in 2018, because this has been available here since the 50s, but Coles, Woolworths, Bi-Lo, Franklins, Aldi, AND Safeway all sell it, and they call it ‘baking soda’, ‘bicarb soda’ or ‘bicarbonate of soda’s. I made this and I recommend cooking for much longer. Perhaps 70-80 minutes. My bread was raw in the middle, but the two ends we managed to save were delish! I baked this bread yesterday! This came out very nice . I could’nt tell you how proud I felt. This is a ” food for the soul”! My 2 year old daughter was saying ” Ammy” (for “yummy”) after eating this bread. Thank you Maria, for the recipe. Looking forward many more recipes from your side. I just made this and although it tasted okay it never really set as a cake or bread. I cooked for 30 extra minutes and it still came out way too wet. I followed the directions exactly as written other than increasing the baking time and it just never came out right. What is the need for the sour cream here? Do you know if subbing Greek Nonfat Yogurt for sour cream will work? I made this recipe tonight and was highly disappointed. I baked it much longer than the recipe called for and it still came out not completely done. I even adjusted my oven temperature. I think possibly the pan you used must have been larger than a standard bread pan. There was too much mixture for my 9×5 pan as well. When I read the Martha Stewart reviews several people had the same problem with the bread not getting done. I think this would work better as a two loaf recipe. Seems like a lot of comments from people who plan to make this but couldn’t determine from comments if anyone had used this recipe. I made this and it was delicious. But have 2 notes to share. This recipe will make 2 loaves not one loaf as is. Also extremely sweet. Plan to make again with 1/2 cup of sugar and maybe unsweetened coconut. Because of all the toasted coconut in the batter this is good for those who want more texture but can’t eat nuts. Nuts would be good too. bread looks nice and all the oh’s and ah’s…, but did anyone try making it yet and can share the experience? I wanted to loved this but not sure what happened. It turned out completely soggy and wet in the inside even after 65 mins of baking. The outside edges were getting a nice golden brown and crunchy but it just seemed like the ratio of wet ingredients was too much for the dry. Disappointed. Can I use the same recipe and make it in a bundt pan instead? This recipe is so old that there isn’t a button to pin it. Can you add that to your post so we can save it? Right under the recipe title there are social sharing buttons, click on the P to pin! I added chopped macadamia nuts. It was awesome. I’ve made this twice now. It’s wonderfully moist and delicious. What a treat! I’m insanely annoyed all of the other comments are about how good this sounds, and no one has actually tried making it. I followed the directions to the letter aside from substituting coconut oil for the butter and it’s been in the oven for at least an hour and a half now… still a complete soft mess with burnt edges. Do NOT recommend. Lovely recipe. I used canned crushed pineapple instead of fresh but it still worked really well, I just made sure to drain and squeeze out all the syrup/juice before adding it to the batter. Gorgeous moist texture, loved it. Wasted my whole morning on this one. Overflowed terribly. Won’t finish baking. Soggy mess. Would not recommend! Followed the recipe exactly. I am making this bread right now and wish I had read the comments first. The author should change the recipe to say it makes TWO loafs of bread instead of one. It overflowed all over my oven. I read the comments after it overflowed, and have split it into two loaf pans – will see what happens. Just made the Loaf. It baked perfectly in 60 mins. Wasn’t uncooked in the middle like some people said. However, I feel it is missing something, maybe vanilla flavouring, or cinnamon or something. Not sure what. Any ideas? I made it last night. In brief, it was good, but not all I had hoped for. I am not sure whether or not I will make it again. It took over 80 minutes. I should have scrolled further down to catch the comments by people who actually made the recipe. I had thought of dividing this between two 4″x8″ pans, but then decided to follow the recipe and see what happened. The batter is a bit “loose”, and it filled the pan so full that I placed the pan on a baking sheet in case it overflowed. That didn’t happen, but I still liked being able to pull the sheet out to tent foil over the top of the loaf at the 30 minute mark. I used the center rack. I would recommend using parchment paper to line the pan with, especially with older pans. At 60 minutes, it was nowhere near done. By 75 minutes, the cake would spring back when I pressed it lightly. I went a little longer, then took it out to cool. It seems to have cooked through except for being slightly under-baked at the very center. The rest of the cake is fine in terms of texture, but seems to be missing something in terms of flavor. It sunk a bit in the middle, but not much. It is a little crumbly, and the flavor is mild, but good. I notice the pineapple more than the coconut. I was afraid it would be too sweet, but with fresh pineapple, it was fine. The recipe could either use more flour, more coconut, or both. It’s good, but not quite as flavorful as I was hoping for. f I bake this again, I will use two 4″x8″ pans, use whatever amount of coconut creates a nice amount of topping, and see if that makes enough of a difference.